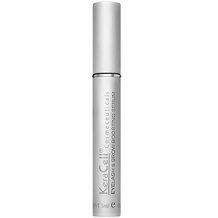 We’ve taken a look at KeraCell Eyelash & Brow Boosting Serum, a product which is designed to enhance the growth of eyelashes and eyebrows. Using this product is supposed to provide thicker and longer lashes within two weeks of first using it. Eyelashes and eyebrows should then have an overall increased volume. This review will determine how effective this product is and if it is the most ideal product for customers to buy. The science behind using plants stem cells for eyelash and eyebrow growth as a little bit controversial but these stem cells do contain growth molecules. More research needs to be done to determine exactly how well these growth molecules act on the cells that produce the eyelashes and eyebrows. The majority of the ingredients here contain antioxidants which help to prevent damage to the follicle cells so that they grow stronger lashes and brows. Malachite is included to protect the follicles from hair loss. Panthenol can provide some form of nourishment to the skin cells that produce the eyelashes and eyebrows and healthy cells produce healthy hairs which are longer and thicker. To use this product customers must first remove any eye makeup and contact lenses. Then the product can be applied directly to the upper and lower lash line and to the eyebrows. Make-up can be applied again but only after the Serum has been absorbed. Customers can use the product twice a day. The price of KeraCell Eyelash & Brow Boosting Serum when purchasing online from the manufacturer is $100. Considering that we could not find any form of discounts for buying this product in bulk or for subscribing for a regular order means that this price is quite high. The price listed also excludes shipping and taxes. This product does come with a satisfaction guarantee which allows the customer to return the product if they are unhappy for any reason even if it has been opened already. The product must be returned within 30 days to receive a refund or exchange. This guarantee only applies to products purchased directly from the manufacturer as there are some third-party online retailers who sell the product. Some of the ingredients in this product require a little bit more scientific research to fully support their inclusion but some of the others are scientifically sound. The product is easy to use and the instructions are clear. The price of the product is quite high because the manufacturer does not offer discounts as some others do. We appreciate the manufacturer offering a guarantee, but have noted that it is less significant than manufacturers who offer longer guarantees of 60 days or more. With all the facts considered we believe customers would benefit from products other than this one, especially those which have better proven ingredients and offer some form of discounts.